By May 19, a week had passed since reuniting the two parts of this colony. It was time to check in. Questions to answer included: had the colony had made progress in drawing out new comb? Was the nasty drone comb being cleaned and used? Were new eggs present? Finally, would the colony need another super of empty frames? I also wanted to throw away any old sugar syrup and give the girls fresh. 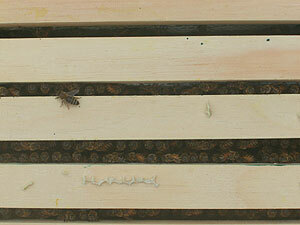 This picture shows the top of Colony 1 with the lid, inner cover, and hive top feeder removed. The bees had been using the syrup, but alot was left and I poured it out (away from the hives) and replaced it. It was reassuring to look down on the hustling bees working the colony. There are not very many, but they are pulling together.